Thanks for stopping by! 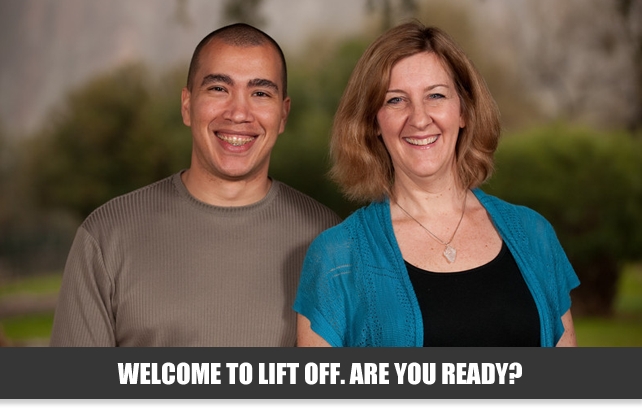 We conducted our last LiftOff Retreat on Sep 16th, 2012 and this event is no longer available. Are you ready to take your business to the next level but don’t know how? We’ve helped five cohorts of Lift Off participants create or reenvision the business that’s right for them and we’re helping one last cohort. Are you ready to be a part of it? If so, join us – Pam Slim of Escape from Cubicle Nation and Charlie Gilkey of Productive Flourishing – for an extremely constructive retreat at Still Meadow Retreat Center just outside Portland, Oregon on September 13-16, 2012. The Lift Off Retreat will then be followed by four implementation calls where we help you stay on course by helping you celebrate your accomplishments, brainstorm new options, and get the maximum value out of the opportunities you build. You are a business owner. You’re smart. You’re creative. You’ve got a business that has some traction, but you have more ideas than you do time – and it’s not at all clear what your next step should be. You’ve tried all the generic advice about growing a business but none of it has really stuck in a way that works for you and your business. You are juggling so many projects at the same time that you often feel like you never give your best effort to any one of them, or get the results you are capable of. You know that you’ve got what it takes, but you also know that you need to make some serious changes to how you run your business so you don’t drive yourself or everyone around you crazy. You’re ready to do this – you could just use someone to help you decide what to commit to and what to let go of so you can rock your business. We get you, and we’re here to help. We have run five successful Lift Off Retreats and have a very clear picture of both the structure of the retreat and the outcomes experienced by the participants. Before we get into details, we will tell you that the very best thing about Lift Off is the people who come. With the right people in attendance, the design works, we can fully apply our gifts and strengths as coaches, and massive change occurs. Lift Off caps at 15 people, so we can have a good mix of people to share ideas, but also so it is small enough for us to give individual attention to each participant. Design – During the design phase, we’ll look at your entire business model and identify how it connects to the vision and heart of your business. We’ll discuss the resonant strategies and business practices that will bring your ideas to life. We’ll also drop the dud ideas and dead weight that has you wheel-spinning and confused. This phase is about the what and why of your business. Plan – During this phase, we’ll take those strategies and distill them into actionable steps so you can make them happen. We’ll build a clear path for you to follow once you’re on your own. This phase is all about the how of your business. Implement – The first two phases will happen at the retreat, but this critical phase is where you’ll actually put your dreams, designs, and plans into play. The implementation calls support you while you’re doing the work of your business. This phase is all about the doing of your business. The live event portion of Lift Off will have a good mix of discussion, interaction, group work, think tank sessions, and individual assignments. We mix things up to keep you learning, engaged, energized, and connected – and we’ll slow down and speed up to match the group’s desired pace. The follow up implementation calls will ensure that you execute your plans, and receive your desired business results. All meals from Thursday dinner – Sunday lunch. Still Meadow Retreat Center is located just outside of Portland, Oregon. It is a beautiful location with just the right combination of physical beauty, open space, and creature comforts to have a totally productive getaway. Every participant will have their own room, so you don’t have to worry about sharing rooms with someone. We want you to have your own time and space to process and relax, and there will always be the Great Room if you want to hang out with people. Want to be there but aren’t sure how you can swing it? Would a payment plan help? It’s made the difference to us before, so we want to make sure you can get there, too, without breaking the bank right now. After we receive your $500 deposit and determine that you’re a good fit, you’ll be sent a list of payment options so you can choose the best one for you. Are you willing to show up and set the stage for an awesome year? Clicking the Register button below will take you to the registration page, where you’ll be able to review the info about Lift Off and start the sign-up process. It is our commitment to serve you 100% with this work — and we want to make sure it’s a fit for you. If for any reason you’re not entirely satisfied with the Lift Off Retreat, you are welcome to a 100% money back guarantee until 8PM PT at the end of the first day of the event. All you have to do is ask and your money will be refunded, no questions asked. Your refund will be issued within one week to your credit card. Yes. Each participant will have their own room. How do I get to Still Meadow Retreat Center? We will provide specific directions and transportation options from the Portland Airport once you sign up. When should I plan on being there and leaving? Dinner will start at 6pm on Thursday and will be followed by a light evening program. The content portion of the Retreat ends Sunday at 3pm, so you can leave after that if you wish – we’ll be hanging out afterward to chill and chat, though. Do you have any questions we didn’t address? Is something unclear? Please let us know by emailing Pam at Pam AT PamelaSlim DOT com or Charlie at Charlie AT ProductiveFlourishing DOT Com.